Marta Pilch-Bartuś (born 1962) graduated from the Pedagogical University (specialisation in Art) in Cracow. She worked with children and teenagers. For many years she was working with easel painting. 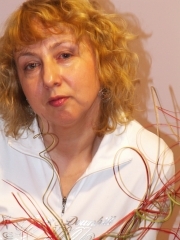 She took part in many exhibitions with her paintings (Gorlice, Rzeszow, Krosno) and many are in the possession of private collections in Poland, Norwegian and Germany. ?It´s not important for me to mediate contents but to search for emotions. First of all I want to reflect my feelings. I want to fill my paintings with atmosphere and moods to provoke associations within the observer. For me a person is important; the way he/she looks, the gestures and postures. During my childhood I was impressed by a painting of Rembrandt: self portrait with Saskia; huge and with an extraordinarily beautiful baroque framework... And Portrait-painting always interested me the most. ?